Lahore: Mr. Justice Nasir Saeed Sheikh of Lahore High Court has said that justice is an attribute of Allah and judges are the lucky and selected people who have been bestowed with the onerous responsibility of resolving the disputes of the aggrieved ones. 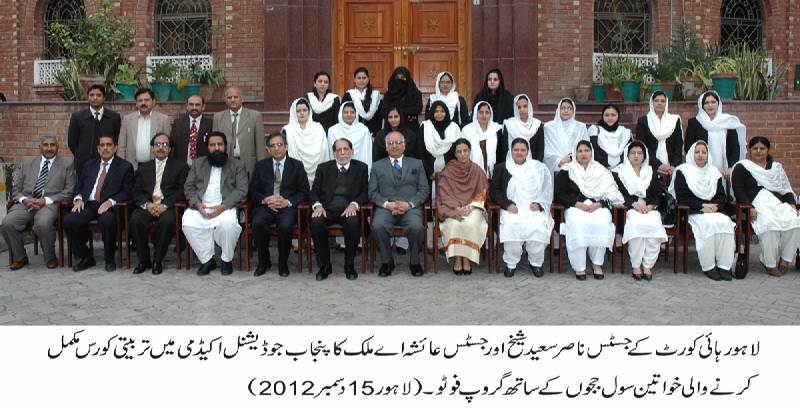 Hon’ble Judge was addressing a concluding ceremony of Capacity Building Training Course for female Civil Judges at Punjab Judicial Academy. Mrs. Justice Aysha A. Malik of LHC, Mr. Justice (R) Khalil ur Rehman Khan, Consultant PJA, Ashtar Ausaf, Advocate General Punjab and Zulfiqar Ali, President Lahore Bar Association also graced the occasion. Hon’ble Judge advised the judges to acquire knowledge and excel themselves in the field of legal education. Knowledge was a unique virtue due to which Hazrat Adam (AS) was declared superior to angels and Almighty Allah ordered them to bow before Hazrat Adam (AS). Hon’ble Judge said that it was a good omen that judges are being imparted valuable training at the Judicial Academy which was enhancing their skills and decision making powers. Judges are a fortunate lot in sense that both the parties to the case repose confidence in him. Therefore, credibility of Judge should be above board. Hon’ble Judge said that there was a great difference between a judge and a lawyer. A lawyer argues the case while the judge has to deliver judgment after hearing both the parties and sifting the truth. Therefore, these virtues and responsibilities enhance the stature of a judge. A judge who lacks decision making abilities is no better than his peon. Director General Punjab Judicial Academy, Mr. Justice (R) Tanvir Ahmad Khan and representative of trainee judges, Miss Samina Hayat also spoke on the occasion. The participants of the course include Samina Hayat, Ms. Shumaila Yaqoob Sidhu, Abida Rafique, Munazza Shehzadi, Shazia Mehboob, Sadaf Liaqat, Nibza, Nadia Mushtaq, Iram Sharif Janjua, Iram Mushtaq, Afshan Sidra, Ashi Azmat, Bushra Farid, Yasmeen Ilyas, Nuzhat Jabeen, Mughira Munawar, Rabia Tareef, Saima Tufail, Ayesha Alamgeer, Afshan Younis.